Gretchen Wilson sheds her hardened image on her new CD, "One of the Boys." 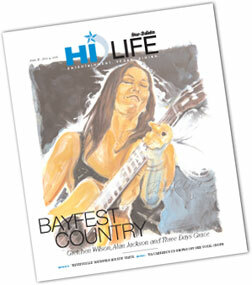 Famous for her hit country song "Redneck Woman," Wilson will entertain a Hawaii audience at BayFest 2007. NEW YORK » When Gretchen Wilson finally got her record deal, she told the execs at her label three things they should never ask her to do: Lose weight, cut her hair or wear a dress. A proud, beer-drinking, tobacco-chewing, jeans-wearing tomboy, she wasn't about to get glammed-up like country's other female stars to achieve chart success. With her multiplatinum 2004 debut album "Here for the Party" and what would become her signature song, "Redneck Woman," Wilson's rowdy outlaw persona became her most popular attribute, which she also played up on her second platinum disc, 2005's "All Jacked Up." THESE DAYS, Wilson is still very much the redneck woman. Her new album is titled "One of the Boys," and she's still got that gritty demeanor, grabbing for her can of Skoal before an interview begins. But she's also revealing a softer side. Her album features her at her most vulnerable. In an interview, she talks about feeling self-conscious about her looks, overcoming the pain of her tough childhood and the struggles of being a single mom of a 6-year-old girl. "I am the redneck woman -- I am tough ... like to stay out and have fun and hang out with the boys -- that's who I am," says the 33-year-old Wilson. "But there's more than that. And I'm hoping that by now, the third record, that with some of the lyrics and the songwriting, that people know that there's a lot more than that." Fans of the singer-songwriter have learned much about the Illinois native over the past few months. Last fall, she released her autobiography, "Redneck Woman: Stories from My Life," which detailed her painful upbringing, including a life of poverty, her ogre of a stepfather and dropping out of school after the eighth grade. It's a book that Wilson had been asked to write repeatedly, and one she had resisted. "Management kept coming to me with book offers and movie offers, and I thought if I do this book they'll leave me alone on the movie offers for a while," she laughs. "I went into it hoping that I could just get it done as quickly as possible and be done with it, but as I got into it, I really enjoyed the whole process a lot more than I thought I would." Before long, she was going through a cathartic experience, exorcising demons with each word. "I finally put a lot of things to rest," says Wilson, who's studying for her GED. "I'm better than I've been, I'm happier than I've ever been, I'm stronger than I've ever been, and I wonder why I spent the last 10 years trying to be something I wasn't." 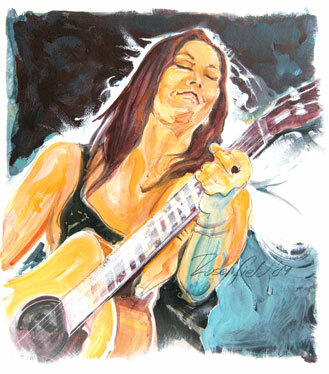 Norman Rosenfield painted a portrait of Gretchen Wilson for this week's cover art. LONGTIME friend John Rich of the country duo Big & Rich, who co-wrote Wilson's Grammy-winning hit, "Redneck Woman," has noticed a change in her outlook on life. "She's accepted the fact that people actually like her," he says. "All the years we were working together before she hit, she honestly didn't think people liked her. ... She was such a guarded, somewhat dark personality of a person." She also feels more comfortable with revealing more facets of herself on record. On "One of the Boys," she sheds her hardened image on several songs, most touchingly on "Heaven Help Me," on which she prays for healing amid a fall. She says that song is particularly difficult to sing live. A few songs she won't perform at all: "I know I won't make it through without crying, and you cannot sing and cry at the same time. It's impossible." Though Rich is listed as a co-producer on "One of the Boys," he and Wilson say it was her show -- she was alone in the studio and determined the album's content, direction and sound just about all on her own. Wilson co-wrote all but one track and calls the album the best record she's ever done. Rich says Wilson has learned to give fans "a true dose of who she is," and not just a retread of "Redneck Woman." "Johnny Cash didn't just talk about 'I shot a man to watch him die' ... he talked about God, he talked about his wife ... I think Gretchen has those attributes," he says. "She's very wise in her creative endeavors." And Wilson acknowledges she will likely never have another massive hit like "Redneck Woman." She calls it a phenomenon, and one she isn't interested in trying to capture again. "From record to record, I'm making the best record I can now instead of what I think I should make," she says. "I try to make the most 'me' record, the most genuine from front to end, and really, honestly, that's my job, that's my only job in this business."